Happy Poetry Friday and Happy Mother’s Day. 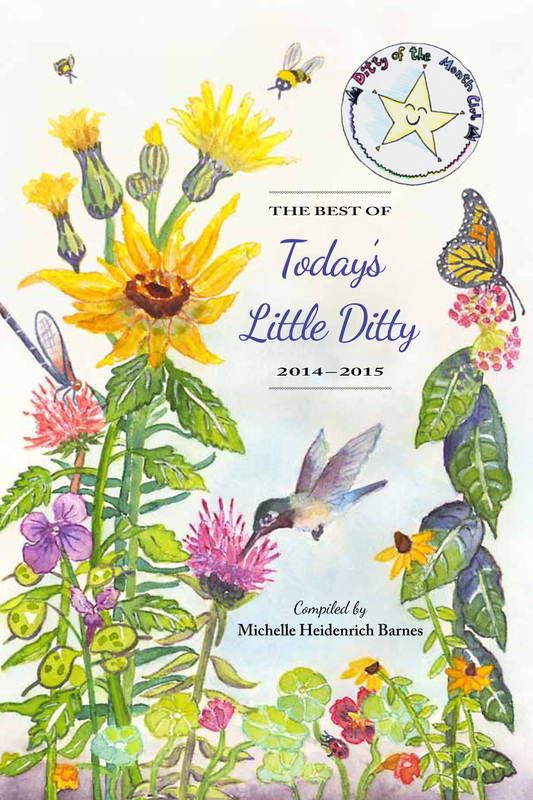 I have the pleasure today of featuring a rich and varied collection of poems from Michelle Heidenrich Barnes’ The Best of Today’s Little Ditty 2016, Poems for Our Mothers. This is Michelle’s second poetry anthology, that includes poems that were submitted for her Ditty of the Month Club poetry challenge featured on her blog, Today’s Little Ditty. For nine months out of the year she offered a Spotlight ON … and interviewed a poet, author, or editor, and then they would present a ditty challenge for all to write on and submit. In this second anthology, the Spotlight ON … interviews included Douglas Florian, David L. Harrison, Amy Ludwig VanDerwater, Marilyn Singer, Laura Shovan, Diana Murray, Jane Yolen, Kenn Nesbitt, and Ann Rider. Michelle’s book hosts a collection of 75 poems by 50 different poets, and in addition she’s included some of her favorite poetry websites and resources–an inspiring book you’ll want to return to again and again! The delightful cover and interior drawings are by Teresa Robeson. In October of 2016 Kenn Nesbitt challenged us to write about Poems for Our Mothers. I’ve selected five of the poems from this section to share with you today, and along with the poem, the poets have included a bit of backstory on their particular poem. Michelle Heidenrich Barnes and her mom. If I was to paint a Norman Rockwell-style portrait of my childhood, it would be set in our cozy kitchen, my mother at the table composing her weekly lists. Mom has always been a list-maker. She handed that trait down to me, along with the propensity to become distracted and start doodling in the margins. Where we differ, is that my mother doodled words, not pictures—the names of people she loved, most of all. It seems funny that those insignificant scribbles should have made such an impression, yet seeing my name there along with my father’s and brother’s assured me I would always be safe and secure in her heart. Heidi Mordhorst and her mom. would you like to hear the rest? © 2016 Heidi Mordhorst. All rights reserved. This poem turns on the finger-plays and story telling of my early years. The toe-tugging of “This Little Piggy,” the finger-folding of “Wire, Briar, Limber, Lock” and, importantly for a minister’s wife and daughter, “Here is the Church”—they were all repeated so often that when I think of them I hear the words spoken in my mother’s voice. Lila Zingerline Mordhorst was also an accomplished seamstress, and as well as making most of her own and my clothes, she taught me to sew. Now that we are both older Indians, “our blankets all covered with frost and snow” (I know not the provenance of that foolish, repeating story), we do spend time rewinding those old threads and restitching loose or crooked seams. We do it all with our voices. gone from me too soon. then disappearing with the years. You laugh just like Mom. Who does she dress like? You sound just like your mother. it doesn’t bother me to hear that? The trouble is, they aren’t thinking. to look you full in the face. I run for my room. I have of truly seeing her. © 2016 B.J. Lee. All rights reserved. This poem is autobiographical. My beautiful mother passed away from a cerebral hemorrhage when I was 17 and she was 36 years old, leaving behind four children, the youngest of whom was just six. This poem captures the years after her passing and reflects a realization I came to at a tender age. My mother had been an artist, painting mostly still lifes and ocean scenes, and I often heard this phrase from those who knew her well, “Everybody loves your mother.” I miss you, Mom. © 2016 Charles Waters. All rights reserved. When I was a wee one my mother would sometimes envelop me in hugs and kisses telling me how much she loved me. Looking back on those special times, a poem came forth. Michelle Kogan and her mom. Being a mom is no easy task, and there’s not a book, or anything else that can prepare you for it, except being there. My mom throughout my childhood filled this role of being there–with love, hope, encouragement, and pride for all her children. This poem comes from an actual event–the outcome for me, small gestures of giving can make a big impact for a lifetime. Wishing all a Happy Mother’s Day! Jama Rattigan, the hostess of the mostest at Jama’s Alphabet Soup is hosting the Poetry Friday Roundup, thanks Jama–and her scrumptious blog posts are something not to miss! This entry was posted in Children's Illustration & Writing, Haiku, Nature photos, Painting, Pencil Drawing, Plein Air Art, Poem, Sketchbooks, Writing and tagged Art, B.J. Lee, books, Charles Waters, Concrete poems, family, For Mom, Heidi Mordhorst, Kenn Nesbitt, Michelle Heidenrich Barnes, Michelle Kogan, mother's day, Mother's Day Poems, poems, poetry, Poetry Friday, stories, The Best of Today's Little Ditty 2016, thoughts, travel. Bookmark the permalink. Thanks Rhonda! Hope you are enjoying some of our warmer weather. I’ll be in touch soon for an alternative date. So much mother love in this post. Thanks for sharing all of these wonderful poems and the stories behind them. Thanks Margaret, yes it feels like it’s brimming over with love. Thanks Tabatha, yes it’s a heartfelt tribute to all moms here! Wow, Michelle – what a treasure. MANY thanks for sharing these poems, pictures, stories… what precious glimpses into these special relationships. Appreciations to all of these poets. Happy Mother’s Day to all the moms, and an extra prayer for those who are missing their mothers. Thanks Robyn for your kind thoughts and prayers. I love the Today’s Little Ditty book, many treasures there, and now you’ve shared so much love these few days before Mother’s Day, Michelle. They are so heartfelt and loving, and I love the pictures, sweet you with your mom! Yes, it’s a wonderfully rich collection, and I’m happy we could spread this love around to all, thanks Linda, Happy Mothers Day! Thanks Michelle, and for your suggestions along the way! That photo of you and your mom complements your poem so well and is smitten with your love for each other! This is such a beautiful collection of poems about mothers and a lovely celebration of special relationships. I loved reading the back stories and seeing the photographs. BJ’s poem and story really resonated with me as my mother also died suddenly, leaving behind 5 children, when I was 14 and she was 38. My poem today bubbled up from a memory of a time shortly after her death. Such a beautiful and touching poem you wrote Molly, from such a devastating loss–that must have been hard to do, thanks for sharing it. Michelle, my apologies for forgetting to include, as I posted last night, a link to your rich Mother’s Day post, in my post! (It’s fixed now.) I’m so chuffed to be included, along with my mom, and it’s so much fun–and filled with universal emotion and specific, longing details–to see other PF friends with THEIR moms. Thanks so much for inviting me! Thanks Heidi, an honor to have you here–I love the playful nature of your poem, the layers folded into it, and your poetic backstory makes it that much richer! Thank you for sharing these lovely tributes. They’ve inspired me. I think I’ll write a poem for my own mother and also for the three children who made me a mother. Thanks Kimberly, I like your idea of writing a poem to your children too! Thank you so much for this beautiful post, Michelle. Love all the poems and photos. Wonderful to learn a bit more about the moms of some PF friends. Your concrete poem goes straight to the heart. Thanks Jama, it’s been a treasure-filled journey assembling it! Thanks B.J. Your poem carries us to this time in your life so vividly and tenderly, and the photo makes it that much richer. Thanks for sharing all with us! thank you, Michelle! It wasn’t an easy poem to write or to share, but in the end, I’m glad I did! What a lovely tribute to mothers! Thank you for sharing these today. Lovely, Michelle! Thank you for the review of Michelle’s poetry anthology and the five poems. Each is so different yet each has lines that resonate with me. I think I enjoyed them even more because of the photos and back stories which drew me back for a second and third reading. Yes, the images and stories add an extra layer of spice to the poems, thanks Alice! Michelle, you have created quite a tribute for Mother’s Day with PF poets and their lovely mothers. The poetry was filled with tender moments and the backstories filled my heart. My Mom is not here to celebrate Mother’s Day with me but she is always remembered for she had a giving heart. Thank you for creating this tribute. Thanks Carol! And for Mother’s Day we’ll keep all our mom’s in our thoughts, especially the memories! Thank you for your including all Moms, Michelle. What a beautiful tribute to your own Mother but others as well. Well done. This post is a keeper. I love that your mom saw beauty. What a lucky girl you are. Such a lovely tribute to your mom Jone, I just read it, thanks for sharing it! I wanted to let you know that this post was my model poems for my students today. Many of them wrote sweet Mother’s Day poems in response, two actually tried the heart shape. How cute are you? What a lovely collection of mom poems. Thank you for sharing them with us. I especially love the shape poems, as they reminded me I haven’t written one in a while. Cheers! Thanks Christie, I look forward to seeing one of the shape/concrete poems turn up on your blog! Thanks Ruth–lots of heartfelt sharing here. Love seeing the photos along with the poems. A very special post, Michelle! I recall seeing some of these poems back when the challenge took place, but a couple of them were brand new to me. All so touching in different ways, because their moms all touched them in so many different ways. Thanks for sharing these! What a lovely post! Thanks for this. I enjoyed every image and every word. Thanks Rosi I enjoyed putting it together! My heart goes out to you, such a life altering happening in a young persons life–and that comparison can’t be easy. Hugs to you for Mother’s Day–and yes if I can remember way back when I think I did wear the sheep outfit. How sweet you are. 🙂 Don’t worry about me. I plant a lot of flowers for us both. Their bloom is healing every year. What a wonderful post to celebrate Mother’s Day! These poems are overflowing with love. I enjoyed reading the back stories and seeing the photos, too. Thank you for this post, Michelle! Thanks for such a fun post! Loved seeing all the moms and hearing the backstories!